Continuing on with our special ‘we love Irish shops’ theme this week we’re going to take a bit of time to get to know, Love Vintage! Love Vintage is literally the love of my life! I, Carolanne Joyce, am on my 13th shop in this lifetime. This one is the most joyful; its ethos is re-use, spread the joy, get all those treasured pieces out of the attic and into the light of my shop Love Vintage!! I also sell new and oid and books. What inspired you to open your outlet and how long have you been up and running? 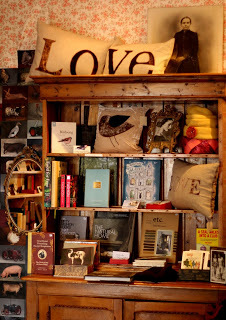 I adore things like vintage tea party, birdsong, Taschen books and our best seller, foraging !!! 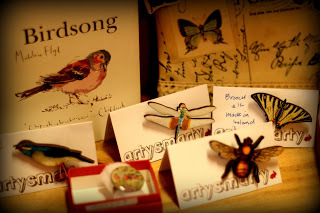 We are all getting back to simpler times beside the most joyous book birdsong are artysmary’s bird brooches. Artysmarty brings such creativity into the shop and of course it sells like mad !!!! What’s your favorite part of having your own shop? Describe a typical day for us! The shop is in a continuous state of change and excitement, re inventing itself to please all the diverse customers who love, like me, Connemara. To travel through the mountains and breathe the still gentle energy of Connemara is bliss itself. I try to reflect that in my shop and what I choose to put in it, the artysmarty collection sits beautifully beside scarves vintage bags…gloves…clip on earrings and so many more unusual pieces from all over the world. A feast for the eyes. 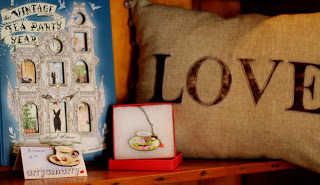 That what Love Vintage is! I love being able to choose mind blowing things that’s why I love having my own shop! I am on my fourth year now yephee !!!! Have you spotted any trends for SS2014 you can let us in on? The trend towards seeing our surroundings in a new way has led to an increased interest in nature. Hence birds, owls, foxs, etc. are selling in lots of forms; brooches, books, necklaces [and of course the foraging theme is the next big thing. (TELL NO ONE !!!!). Come to Clifden, Connemara we are on Market Street. Phone me for opening times; Carolanne +353 (0)85 1515 879.